A big Anti- American Rally Taken Place in Tribal Areas of Pakistan on Friday against the Thousands of Civilian Killings In American drone attacks in last few years. The Rally Taken Place in Miranshah City of Tribal Areas in which thousands of Locals Participated including relatives of those who where killed in Illegal US drone attacks. The Protesters raised slogans against US drone terrorism and demanded an end to these attacks. Effigy of President of America Barack Obama was also burnt by the Protesters. They raised the slogans like "Killer America" and "Go America Go". 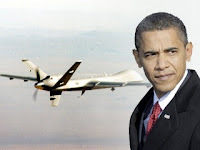 In just 2010 more than 120 Drone attacks where done by CIA in Pakistani Tribal areas which taken 1200 lives and hundreds got Injured. US Officials and Media Keeps on shouting that Terrorists gets killed in these attacks but reality is that not more than 20 Terrorists have been killed in all drone attacks done till now but thousands of Civilians lost their lives. These attacks also increases hatred against US in Pakistanis.